Are you one of those couples who want to get creative with their nuptials and replace the traditional wedding guest books with more creative options? If so, this article is for you. In this blog post, we will have an in-depth look at some personalized wedding guestbook alternatives and will suggest how you can best use them. Needless to say, a wedding guest book is a great way to look back and think about the guests with whom you shared terrific moments on your wedding day. Conventionally, what happens is – a station is organized where guests write a sweet note for the couple. However, this method is too mainstream, as once the wedding is over, these guest books rest on the bookshelf for years to come. This is not the best way to remember your memorable day. This is where the concept of personalizing the wedding guestbooks comes into the picture. Are you a travel junkie? How about asking your guests to write the messages on a world globe? 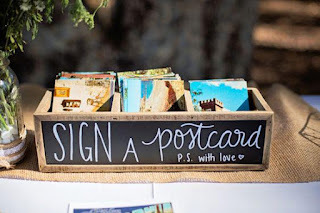 Or, if you are a home decorating enthusiast, you can ask your wedding guests to write their well-wishes on a wood panel which can then be used as a centerpiece and then as a seat for your backyard swing. Thus, all you need to do is make the best use out of your creativity and have your own guestbook which is exciting, unusual and, at the same time, catchy enough to attract attention. Get ready to provide a contemporary twist to your traditional wedding guest-book with this Wedding Wishes Signature Frame. 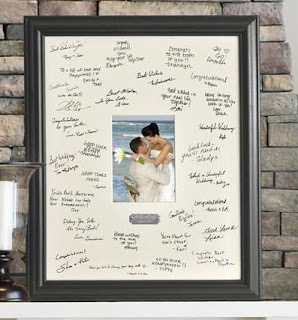 This frame allows your guests to sign and write their well-wishes on its edges. What’s more? You can even personalize this frame by getting two lines up to 20 characters engraved on the brushed silver plate with the new couple's first and last name. What’s more? Once the wedding is over and, your guests have written the well-wishes on this canvas picture wedding guest book, you can use it to decorate your home! Place it on your fire place mantal or a side table and think about all the good memories whenever you pass by. 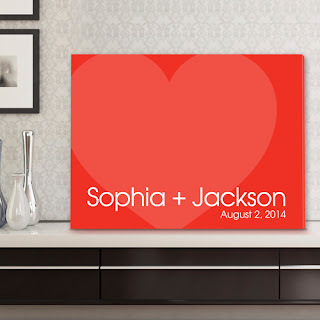 Let your guests jot their good wishes on this Heartful Wishes Signature Canvas. What could be a more fascinating way to ask friends and family members to write their heartfelt messages than this canvas? Beautifully decorated with heart-shaped imprints offer each guest an opportunity to write their congratulatory messages in their own hand. What’s more? You can personalize the wrapped canvas with you and your spouse’s name along with your wedding date imprinted at the bottom. This hanging canvas will display a lovely reminder of your wedding memories for years to come! 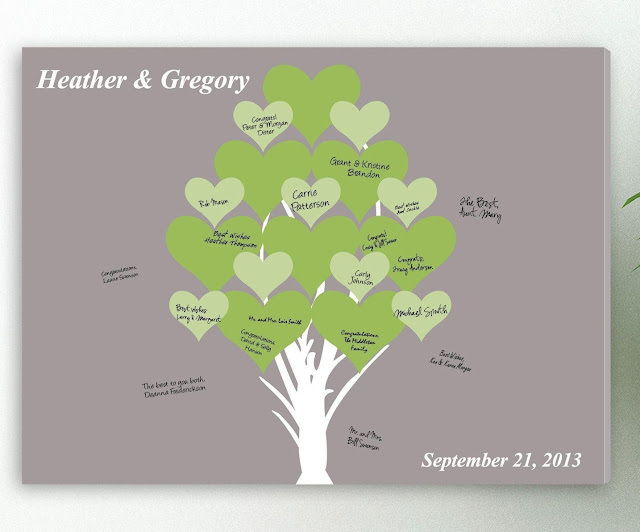 Provide a lovely twist to your contemporary wedding guest book with this Love Forever Signature Couples Canvas. Get your name and date of the event printed on the lower right corner and ask the guests to write their messages on the heart motif. This tone-on-tone canvas guest-book can then be used as a home accent item in your new home. Once you hang your canvas, when you walk by your guest-book it will be inspiring to enjoy remembering your special wedding day? Do you love to try DIY projects? Then, here are some ideas for you to consider. 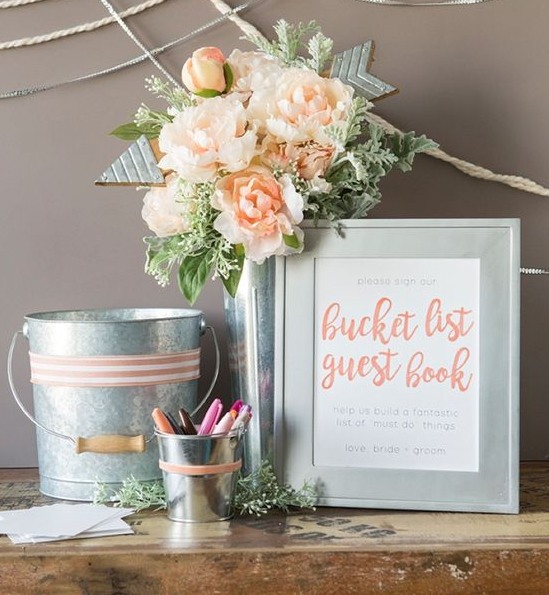 Do you know the best thing about a DIY bucket list guest book? You can customize it the way you want! This one is pretty simple. All you need is an old fashion metal galvanized bucket, card stock matching your wedding color scheme, a few marker pens, and a rustic picture frame. Ask your guests to write fun ideas that you (as a couple) should have on your bucket list. Guests can write their thoughts and suggestions on the cards and put them in the decorated bucket. This guestbook method is a fun and creative idea. You can put these cards in a scrapbook and can try all the exciting ideas your guests have suggested. Then wouldn't it be fun to post your experiences on your Facebook page? Every wedding has a unique story, and this Customized Our Story Theme Couples Canvas Guestbook will let you artistically depict your experience! 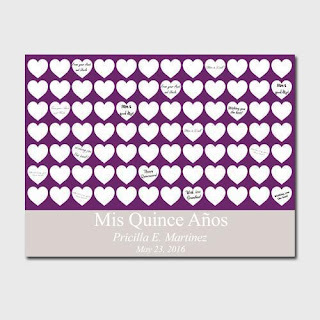 How about asking your guests to write their well-wishes on the heart-shaped panel at the center in a variety of ink colors? Or, let’s have more fun, by asking them to write something about you as a couple, and so on? 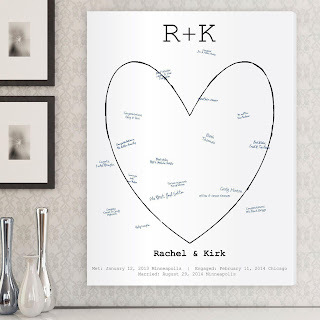 At the top of the heart outline, add your initials in the old fashioned style of “R+K”. Then under the heart, add your first names along with the specific details such as your wedding city, wedding date, and location to further make the design look more beautiful. There could be nothing more thoughtful than this! The well-wishes from your friends and relatives are definitely going to make your life bloom. This blooming tree features single hearts as leaves. You can ask the guests to write their good wishes on the heart blooms. Additionally, you can customize the canvas further by adding your names and wedding date to it. What's more? You can hang this personalized blooming hearts signature wedding guestbook canvas in any corner of the house! Looking for some fun guest book ideas? How about Sign A Postcard? Do you love traveling places, and have a vast collection of postcards from different places? Or, do you intend to travel a lot after the marriage? Well, whatever the case is – just collect a lot of postcards from different places and ask your guests to sign them. Thus, whenever you think about visiting a new place or reminiscence over the already visited one, you will have something worth remembering from your wedding. We’re sure, you would definitely love this one. How about using a wishing jar as an alternative to conventional guest book? You can arrange a pretty looking mason jar with a decorative lid and a few wooden hearts. The guests can write their good wishes to the bride and groom onto these wooden hearts and put them into the jar. Such an arrangement would help you in cherishing all the warm memories for years to come. And what’s more? This arrangement is convenient to store or display as it would not require a lot of space in your cozy apartment. This idea involves a bit of advance arrangement but it is worth it. All you need to do is ask your photographer or another friend to click pictures of your guests. Next, allocate the task to one of the wedding attendants or ushers. They will paste the photos in the scrapbook and would ask the guests to write their wishes next to their picture. This tip jar alternative idea for a guestbook is perfect for the couple that loves having fun. Similar to glass wishing jar, you can also make a newlywed tip jar wherein you can ask your guests to provide tips for a happy married life! Rest assured, you will have a good time while going through all the tips written by your guests. And who knows you may find they offer some fantastic ideas for your marriage. 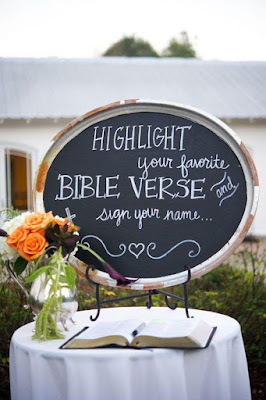 How about asking your guests to write their favorite bible verse for you, and sign next to it? We detailed some of the coolest ways through which you can ask your guests to write well-wishes for you. However, it is easy to get confused amid so many options. So, what is the best way out there? The easiest way to make a choice is to keep your priorities in mind. Do you want something that is compact and can be easily kept in a drawer? Or, do you want something that can become an artistic piece inside your home? There is nothing worse than running out of supplies. Thus, ensure that you have enough pens in different colors, cards, and other supplies. Further, provide clear instructions so that there is no confusion. After all, writing well wishes should be a smooth and comfortable experience for your guests. Regardless of the format you choose, you do not want your guests to go without signing your guestbook. Your guests should easily find the guest book. Thus, make sure that you designate a focal location that everyone will see as they enter the wedding location. Then it is also highly recommended that you determine the layout of your reception by keeping the guestbook placement in mind so that your guests do not miss it. One great idea would be to place it next to your wedding cake to be easily seen. However, if you do not want to set up a special area for this, it is recommended to put someone in charge who would make sure that the wedding guest-book moves smoothly between the guests. So now that the wedding is over, review your wedding guest book. Make sure you take enough time with your spouse and have a look at what your guests have said for you. Some comments maybe so meaningful that you would like to thank your wedding guest writer. We hope that this article highlighted some of the best alternatives to wedding guest-books. If you feel traditional wedding guest books are a bit too mainstream, it is the time to embrace your creativity and make use of some of the artistic guestbook styles we discussed above. Although, the DIY approach is fun and cost friendly, but can prove to be a big headache at the last moment. You might already be managing a lot of things – from fitting your dress to entertaining out of town guests. So, this is when ready-to-customize wedding books which you can order online can come to your rescue. You will not need to invest a lot of time for these options. Just browse, select and order! Surprising an office staff with a unique and lasting gift. One of our regular customers recently made his office staff happy by giving each female member of his office staff a gold dipped rose. He selected each staff member's favorite color for the rose petals. Mark said that the recipients were not only pleased with the gorgeous roses, but they were also impressed with the designer gift box, stretchy ribbon and bow, and the certificate of authenticity inside. This card explains how a real rose is preserved with lacquer and trimmed or dipped in 24 karat gold so that it will last a lifetime. “I love, love, love it!" While another staffer was amazed that you can see the intriguing vein detail in the delicate petals and leaves. And the rose stems still have their thorns even after they are dipped in 24 karat gold. Having a go-to gift for important occasions that you know they will love. Ed states that his wife looks forward to getting a new rose for Valentine's Day and her birthday. He adds a new color to her collection each year which she displays in a cut crystal vase on an end table in her gal cave. His wife loves the range of pastel and vibrant colors available. She is also excited that her roses will last for years. Recording important life events with messages on petals. You can order a new baby rose in any birthstone color and add the details of your child's birth to mark this important occasion. Here is what a new mom said about the rose she received after her daughter was born. Celebrating special anniversaries with gold and silver dipped roses. So you can't believe it, you have been married 25 years! This anniversary makes many men panic while they look for a gift to make their life partner happy for this super important accomplishment. 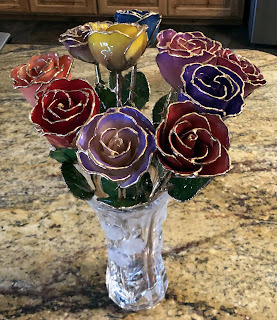 If you are celebrating your 50th wedding anniversary only the gift of gold dipped roses will do. How to make your own BBQ Gift Baskets and what to include in you collection. Barbecue gift baskets are becoming the rage for do-it-yourself gift giving. Whether you are a guy or gal, you probably enjoy an entertaining backyard barbecue. As a result these specialty BBQ themed gift baskets have become popular choices for birthdays, anniversaries, family vacations, and holidays for the hard to buy for person on your gift shopping list. What to include when making a BBQ gift basket is a matter of taste. There are many options that you can include. No matter what you choose to add it’s really a fail-proof gift. There are a few guidelines you can follow to help get you started, depending on the type of basket you want to make. Start with a useful container... add items, decorate and create! Every basket needs a useful container of some sort, the items you are including in your gift collection, and the materials to decorate the basket. Beyond that, let your creativity take over! 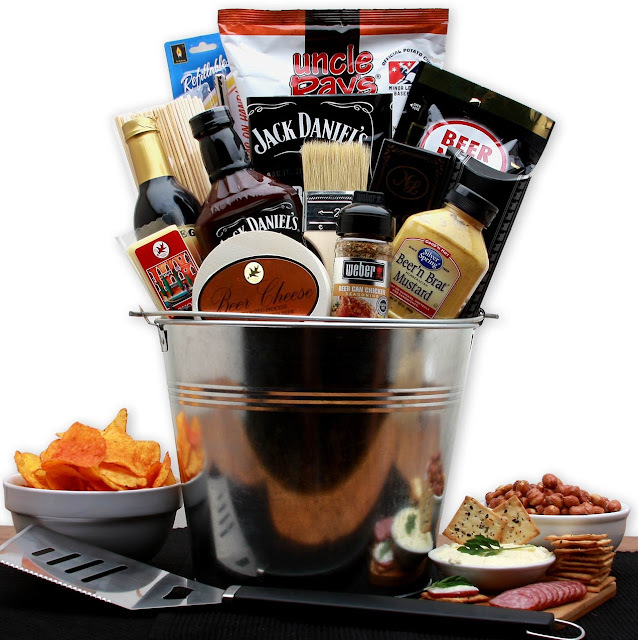 Here are some ideas to help you make your own Barbeque Gift Baskets. For everyone who enjoys a good barbecue but does not have the materials to master the skill, here is your opportunity to throw together a kit for them. Start with a useful container such as a galvanized bucket, a tub or an insulated cooler (they can later use this to cool their beverages), or picnic basket and then add the basic tools needed to cook. These utensils can include things like long handled spatulas, brushes, and wood handled tongs. Throw in a personalized apron and some kitchen towels with a sports team they like or a design that you know they will appreciate. Be sure to remember the potholder! Even better to top off your gift, add an outdoor cooking recipe book. And don't forget a corkscrew or bottle opener. Now seal the basket with decorative cellophane wrap. You might even add a bow or tie your gift closed with red and white checkered napkins! What is so great about a BBQ gift basket is that it makes a handy way of having all the grilling needs in one place so they are ready to go outside when you are ready to light the grill. 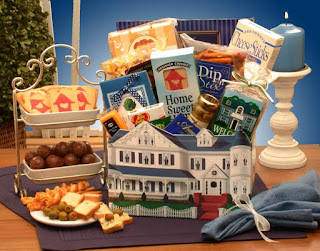 Personalize a gift basket specifically to include what they need and are sure to enjoy. If you would like to make a great bbq sauce to include in your gift basket, you can find some of the best barbecue sauces in this list of 5 BBQ sauces from BroBBQ. Anyone on your gift list who prefers to cook in their own backyard will truly appreciate a BBQ gift basket that has everything required to quickly make a scrumptious meal while enjoying family and friends and the great outdoors. For the beginner or pro barbecuers, this vacation style picnic basket is the way to go. Everyone loves getting new grilling gear and tools, so this gift is always a hit. Grab a picnic basket for your base, put a table cloth in the bottom and then start adding in the basic tools needed for barbecuing. Beginners’ tools can be simple, or you can tweak them for the experts by adding personalization or finding one geared towards their interests. Be sure to include items such as a BBQ knife, stainless steel spatula and tongs, and a heavy duty grill brush. 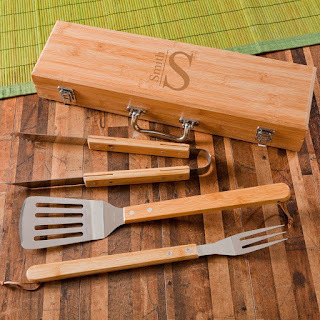 Or you can add a tool set such as monogrammed case featuring BBQ grilling utensils. An NFL spatula with bottle opener also makes another handy addition to your BBQ Gadget Basket. Include a handy automatic instant read digital meat thermometer probe to make sure they cook the meat to the perfect temperature. Barbecue kabob skewers also make a useful addition to any gift basket. Use matching napkins as part of the packing to protect the contents if you need to ship your gift. And don't forget a stick lighter required to get the party started. If you are not sure which BBQ grilling tools to get see these products are reviewed by BroBBQ. The person who loves to entertain a crowd in the back yard while showing off their grill skills is sure to enjoy a gift basket featuring a variety of spices and sauces. 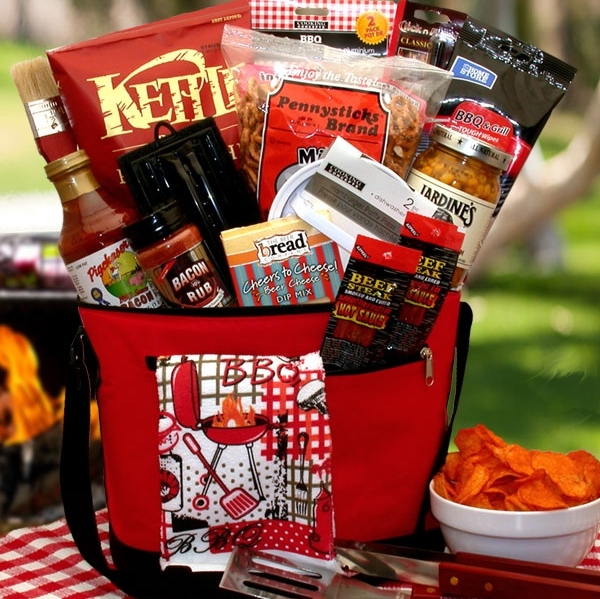 A BBQ Basket with a collection of spices and sauces works great for Father's Day or as a housewarming gift. Start with a tin bucket or wide mouth flexible cooler. Pack in dry rubs and powdered seasonings. Marinade mixes also work well. Include barbecue sauces in different flavors to top off a food-based gift. Sauce aficionados will be delighted by a BBQ sauce gift basket that offer an assortment of tasty flavors, from spicy and sweet to tangy and savory. Making a gift yourself always adds extra pleasure to the giver and the receiver, and that is true with BBQ gift baskets as well. Even though Labor Day officially marks the end of the summer grilling season it turns out that almost half of us barbecue year round. Some even do so during freezing temperatures, so consider giving a BBQ gift basket to friends and family members this holiday season. Short On Time ... Or your Barbecue Basket Online! Short on time, don't fret! You can order a variety of prepared BBQ gift baskets online and have them shipped and delivered direct to the recipient. No matter the skill level of the recipient, these gift baskets are always appreciated and used often! After all every cook wants to spice up their BBQ game. 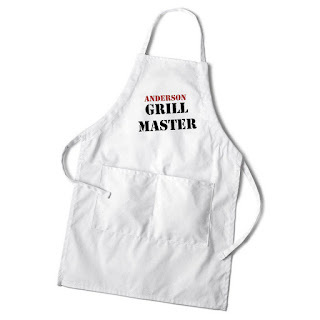 So thrill the griller in your life with tasty BBQ gifts they’re sure to love. You may even get the added bonus of being invited over to enjoy the meal that is cooked using your excellent gifts! Choosing a housewarming gift is no easy feat. You want to give a recipient who is moving to a new home something that will actually be put to good use. At the same time, you also don’t want your gift to be too mundane. And while gift cards may always seem like the easy choice, you may want to rethink this option since according to Market Watch one billion dollars worth go unused each year. Rather, find a housewarming gift that’s the perfect combination of high-quality, thoughtful, and useful. What does this look like? You do not need to spend a lot to make new homeowners owners feel welcome or to congratulate a friend on moving to their first apartment. Check out these suggestions that are as charming as they are functional. Cloth Napkins Make An Elegant Housewarming Gift. While cloth napkins may not seem like anything special, they make a great housewarming gift. Cloth napkins are super useful and instantly make meal times seem fancier. Just imagine how much using elegantly monogrammed cloth napkins would add to your mood when you’re living out of boxes during the first few weeks. 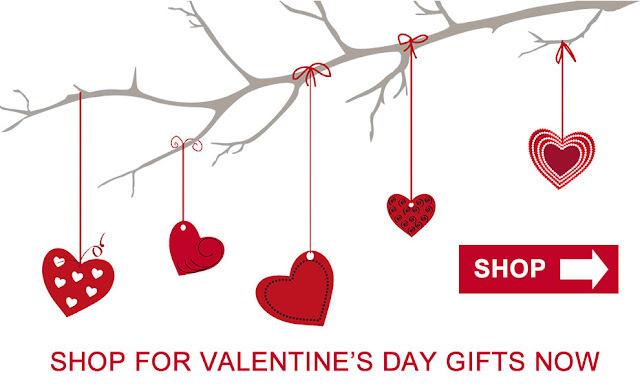 Your recipient will love using them and will appreciate receiving such a practical and stylish gift they probably wouldn’t have thought to get for themselves. When it comes to material, go with linen which has natural antibacterial properties and it gets softer after washing. Then add a family initial or monogram to personalize your gift. Every hostess will tell you that they can never have enough napkins. Ultimately, you want to choose a beautiful napkin set that complements your recipient’s decor taste. Say Welcome with Housewarming Gift Baskets. Nothing says “congratulations!” like a beautiful gift basket brimming with gourmet goodies. Fruit gift baskets are a perfect choice — particularly ones featuring tropical or exotic fruits that are healthy snack packed with vitamins and antioxidants. These gifts can be received by new homeowners the same day they are ordered. They are hand delivered and arranged by a local florist. You can even add in a few treats like chocolate, cookies, or a bottle of wine or champagne for celebrating their new home. Top your selection off with some meats and crackers which will come in handy if the new homeowners are not cooking at home yet. Gifts of wine may delight the new homeowners after a hard day of moving and unpacking. Or you could decide to give a housewarming gift basket filled with helpful items such as kitchen or shop tools. You could fill a useful container such as a bucket or toolbox with other useful things like household tools or gardening supplies. And the good news is that if your friend or family member moved away to a different town you can still send them a wonderful housewarming gift. Just shop online! 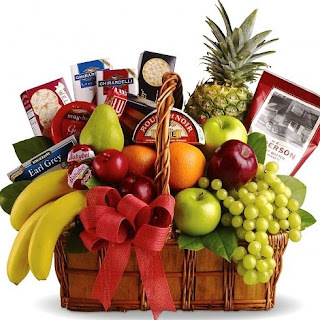 At Arttowngifts.com we feature both hand-delivered fruit and gourmet baskets and practical gifts such as our BBQ gift baskets or a garden gift. 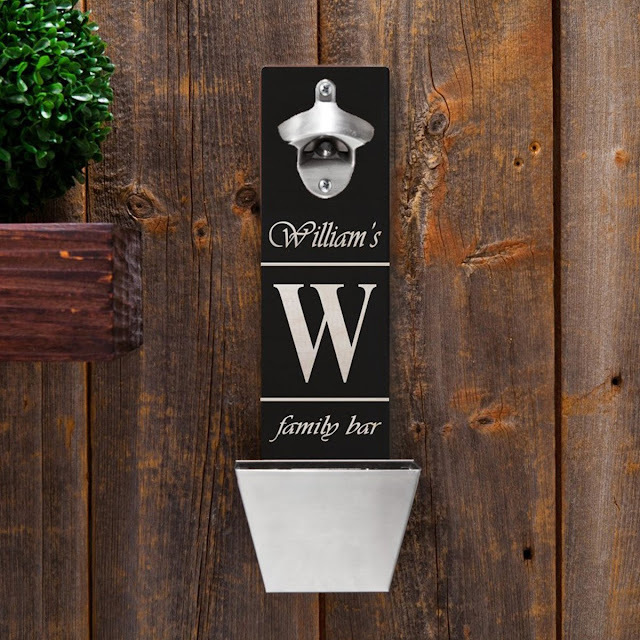 Our most popular housewarming gift is a family last name sign. One style is a painted family name sign that features their last name with either a welcoming inspirational quote or the family member's names. 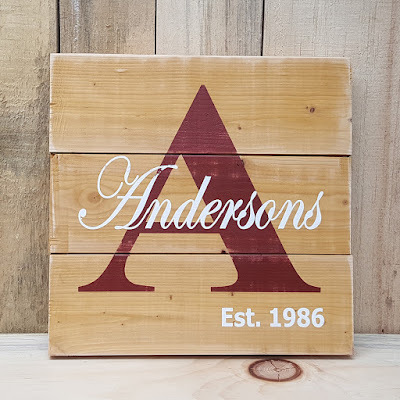 Another custom family sign version starts with a rustic stained pallet board that features a monogram or an initial along with the family's last name. If the new family loves their new home state then consider ordering a state silhouette sign with their family name. The latest current trend in family wall art is the architectural photo name matted and framed print where a family name is spelled out in photos of letter designs. Once moved in, new homeowners have to go through the arduous process of informing their friends and family of their new address — one responsibility on top of many. You can help them out by giving them something to make the job easier and a lot more fun. A self-inking personalized return address stamp is a thoughtful gift that’s bound to get a lot of use. You can even include a stack of “I’ve moved” postcards to round-out the gift and make it even more practical. Custom address labels are also convenient and economical. Whether you choose an address stamp or labels create a custom design with one of the many design wizards available online. And as a bonus, your friend will think of you every time they send a letter! There’s no need to settle for dull and boring housewarming gifts when there are so many clever and useful options out there. Anyone of these gifts is bound to delight the lucky recipient. Which one will you choose to help new owners celebrate their new home? Rachel Stinson has always had a knack for writing, food, fashion, and places. Blogging has combined all four for her with an added bonus of enthusiastic audiences. She expertly analyzes real estate, restaurants, and online fashion stores with respect to pricing and people involved and can express her opinions in an unhesitating, engaging manner for a variety of topics. Choosing the right gift could keep your long distance relationship on track. Sending the right gifts at the right time often enhance a long distance relationship. Anyone in a long distance relationship will identify with the saying that absence makes the heart grow fonder. But there’s science to back up that claim. A study revealed that couples in LDRs (long distance relationships) can be closer than those who are not. Published in the Journal of Communication, the research showed that LDR couples shared more meaningful feelings than other couples. That said, being hundreds of miles apart can still put a strain on even the strongest relationships. One way to maintain the connection with a loved one across the miles is to send a thoughtful gift or package. A surprise champagne gift basket in the mailbox is sure to make any heart flutter. A bouquet of heart shaped love balloons a teddy will impress any gal or guy. Adding a personal touch to any gift you send will instantly remind your partner of your special love for them. Your personalized gift will also be unique, making it a treasured item that symbolizes your love and relationship for years to come. Sending one half of personalized pillow case set - and keeping the other - can be a romantic way to show that, despite the miles between you, you’re still connected. A personalized romantic state sign is a wonderful gift to share. 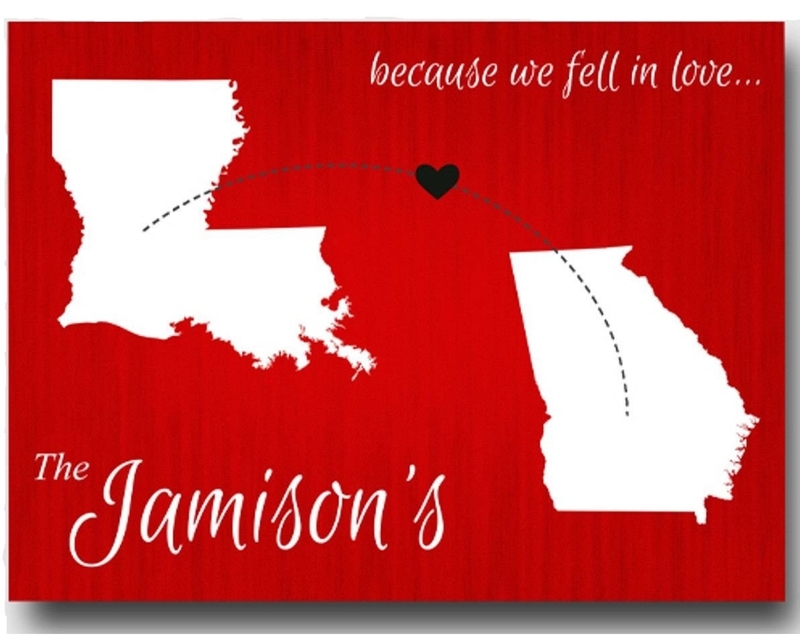 Displaying two states connected by a heart and a quote that says because we fell in love..... this sign would make a great item to add to a home that you share. If you and your guy friend or husband are separated by distance you can't go wrong by sending them a food gift occasionally. 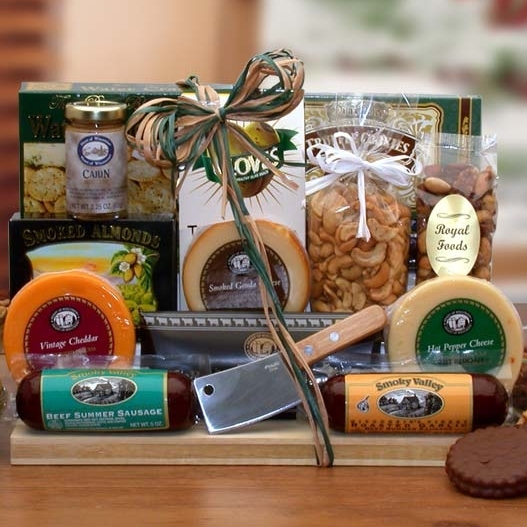 Guys like to eat big so forego the dainty gifts and consider sending them a hearty meat and cheese gift basket. Or if they like beer, consider a beer basket. The way to a woman's heart includes chocolate. So when you want to remind her of your love for her send her chocolate gift basket. There are lots of gifts featuring chocolates available for ordering and shipping online including chocolates and champagne, candy gift baskets and even fresh bakery gifts. And instead of sending a fresh flower arrangement choose gold dipped roses which are much better since they will last for a lifetime. Sometimes a thoughtful practical gift can really show someone you care. And even more importantly that you listen to them! If your partner recently lost their favorite monogrammed water bottle, sending them a personalized one will be a cute surprise they won't expect. 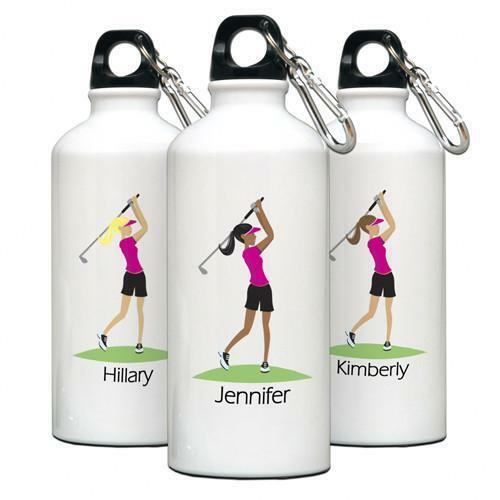 Plus, as they’ll be carrying the bottle with them wherever they go - it’s the perfect way to keep reminding them of your important connection. If your fiancee is wrecking his dress pants by sitting on a large wallet consider giving him a monogrammed money clip. Since you both may travel regularly to see each other why not give each other personalized luggage tags. Does your girl friend play the role of wine connoisseur? If so she is sure to enjoy using a personalized wine bottle opener. 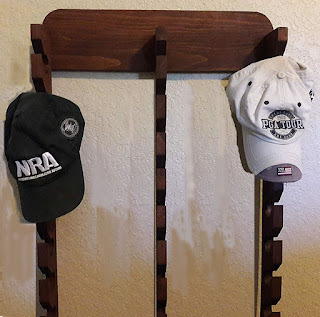 While your guy make prefer beer so give him a gift of convenience with a bottle opener and cap catcher wall sign. Sometimes, no matter how well you know someone, the best gift to send could be a gift card for their favorite retailer. That way they can treat themselves to a luxury item, something they have always wanted or anything else they really need. They'll still get the warm fuzzy feeling of receiving a gift from you, but have the freedom to choose their own item. Be sure to write a heartfelt message to send with your card, to give it that all important personal touch. Don't under estimate how much a gift message from you can mean. Sometimes even just slipping a gift card from a favorite store inside a romantic greeting card and your personal message is more than enough to show you care. Don't get too concerned with what to buy your partner. Research shows that the best gift we can buy for a loved one is something for which they have asked. Sometimes going for the big surprise moment isn't the best approach. If your loved one is telling you all about their constant cookie craving, send them a cookie basket or a giant fortune cookie. Maybe they’ve recently printed out pictures from the last time you met up? Time to send a picture frame so they can show off their favorite photo. Or have they been leaving travel brochures around the house. If so that is a hint that it is time to take a romantic trip. Ultimately, keeping in touch regularly and sending thoughtful packages will strengthen your relationship - no matter how many miles there are between you. One day, when you’re living together in the same state and city you can look back on all the keepsakes and remember the moments you shared along the way.